The seemingly tireless new President Magufuli of Tanzania has started his term of office with a number of spectacular measures most of which are not only proving extremely popular in Tanzania but also attracting interest in other East African countries and beyond. It could be described as a huge ‘cleansing’ operation in which the main features include: a drive to eliminate corruption (in response to widespread demands from the electorate during the November 2015 elections); a cutting out of elements of low priority in the expenditure of government funds; and a better work ethic amongst government employees. The President has changed so many policies and practices since taking office in November 2015 that it is difficult for a small journal like ‘Tanzanian Affairs’ to cover them adequately. He is, of course, operating through, and with the help of ministers, regional commissioners and others, who have been either kept on or brought in as replacements for those removed in various purges of existing personnel. The following is a list of some of the President’s changes. Some were not carried out by him directly but by subordinates. It is clear however where the inspiration for them came from. • during his swearing in ceremony gave authorities 15 days to eliminate ghost workers (people who do not exist but receive a salary – at least 1,680 ghost workers have now been removed). He said that the youth in the country should work instead of playing games, such as pool, during the day, while leaving adults to work on the land. • the Minister of State in the President’s directed ministries to open registers in which public officials will declare all gifts of a value exceeding TSh 50,000 ($23) they receive; the Commissioner of the Ethics Secretariat commented that, although the law was specific on the matter, he had not come across any gift declaration by any civil servant! Dr. Magufuli and his family are said to live modestly. His wife is a primary school teacher and the children go to state schools. It is understood that the President travelled abroad only 5 times during the 20 years he was in the Cabinet. The elections on the mainland of Tanzania in October 2015 went well and the results seem to have been accepted by the people as having been free and fair. 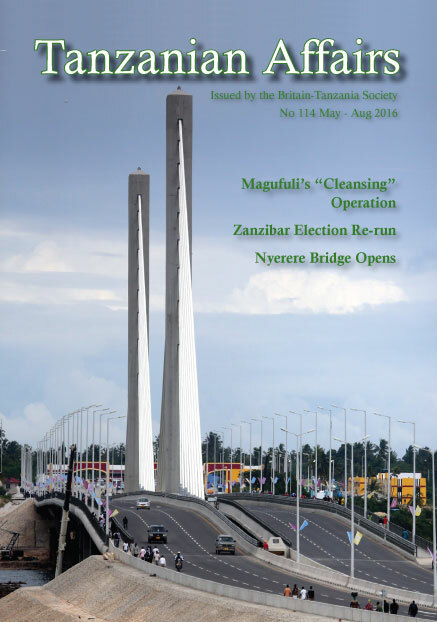 A detailed account of what happened and the subsequent inauguration of the new government of Tanzania were fully explained in Tanzanian Affairs No. 113. In Zanzibar, however, elections are traditionally highly contentious and this one was no exception. 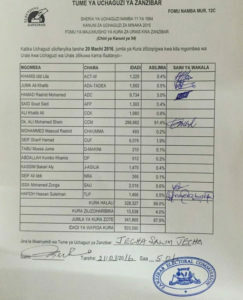 As counting of the votes was still going on, Chairman of the Zanzibar Electoral Commission (ZEC) Jecha Salim Jecha, stopped the counting and declared that the election was annulled because there had been ‘rigging’. He said that there had been irregularities on the northern island of Pemba – a stronghold of the main opposition Civic United Front (CUF) party – which had won all the seats there in the 2010 election. In some constituencies the number of voters had been greater than the number of people on the register, Jecha said, adding that there had also been fighting between members of the ZEC Council which rendered the results invalid. The CUF opposition party declared that it had won the election by a small majority and therefore that its leader, the then First Vice-President of Zanzibar Seif Sharriff Hamad, was the new President of Zanzibar. The making of such an announcement goes against the Zanzibar Constitution which states that the results can be published only by the ZEC. Hamad (who was also the First Vice-President of Zanzibar under the unity government), had made three previous attempts to obtain power in elections in Zanzibar, the fairness of which had been questioned at the time by several observers. The ZEC, which includes personnel from CUF and from the ruling Chama cha Mapinduzi (CCM) party, then announced that there would be a second election, which was held on March 20th, 2016. CUF and several very small opposition parties declared that they would not take part in this second election because it was illegal and unconstitutional. Three other small parties however took part in the election. Before and during the second election Hamad was said to have been travelling in Saudi Arabia, Oman and Dar es Salaam for medical treatment. Needless to say, the turnout in this second election was very different from that of the first, because of the CUF boycott. 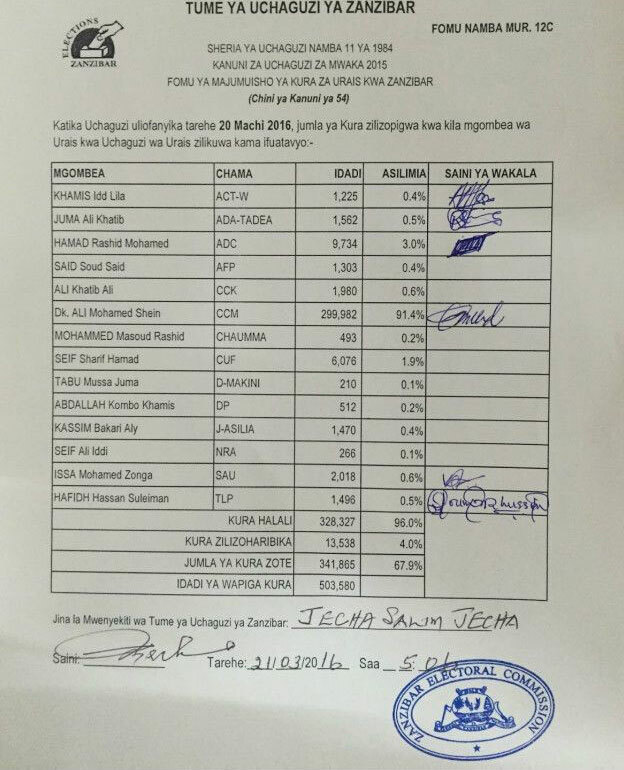 Its actual vote plummeted, and the CCM Presidential Candidate, Dr Ali Mohamed Shein, was re-elected with a huge majority. For the last three years in Zanzibar, the opposition CUF party shared power, apparently amicably, with the CCM party in a Government of National Unity. After the 2015 election in Zanzibar, CUF proposed an international mediator to help resolve the deadlock which had arisen in the Isles, but this was not accepted by the CCM. CUF then declared that it would not take part in the second election and later threatened to launch a ‘civil disobedience campaign’ against the government. As this second election had approached, army and police forces were strengthened by the arrival in Zanzibar of reinforcements from the mainland which ensured that the election passed peacefully. At the end of the second Zanzibar elections, the position of the CUF Party has been greatly weakened in the Zanzibar House of Assembly. Paradoxically, however, it has strengthened its position in the National Assembly in Dar es Salaam by winning 42 seats – more than ever before. (Elections to National Assembly seats were not subject to the ZEC annulment, and so were not re-run in March). The main opposition CHADEMA party on the mainland has also been strengthened by gains it made in new areas where it had not been present before [TA No. 113]. However, CCM now occupies 188 of the 256 contested seats in the National Assembly plus a large group of seats reserved for women, so that the CCM majority has risen to 252 seats out of the total of 364. The combined opposition parties are therefore still a long way from achieving real power in the two branches of parliament. Furthermore, it is the President who exercises most of the power overall. 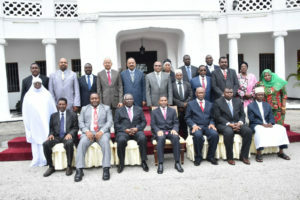 The cabinet, constitutionally known as the ‘Revolutionary Council’ (RC) includes MPs from three small parties not previously involved in government including Mr Hama Rashid, the leader of the Alliance for Democratic Change (ADC), who becomes Minister for Agriculture, Natural Resources, Livestock, and Fishing. Juma Ali Khatib from the ADA-TADEA party and Said Soud Said from the Alliance for Farmers Party (AFP) have been appointed members of the Revolutionary Council or cabinet ministers without portfolio. Mr Khatib and Mr Said are new faces in the cabinet while Mr Rashid is a veteran politician who served as minister during the First Phase Union Government under Mwalimu Julius Nyerere. He was later expelled from the CCM and joined CUF until 2015 when he was expelled and joined the ADC. Other appointees include Issa Haji Ussi (Minister of State – State House and Revolutionary Council) who had been Deputy Minister for Infrastructure and Communication; veteran Cabinet member Haroun Ali Suleiman has this time been picked as Minister of State responsible for the Constitution, Legal Affairs, the Civil Service, and Good Governance); Haji Omar Kheir, who retains his position as Minister of State (Regional Administration, Local Government and SMZ Units) and, Mohamed Aboud Mohamed who becomes Minister of State in the Second Vice-President’s Office. Other appointees are Mr Rashid Ali Juma, formerly Director of the Zanzibar Municipal Council as Minister for Information, Tourism, Culture, and Sports; and Ms Maudline Castico, CCM cadre and publicist, who becomes Minister for Labour, Economic Empowerment, the Elderly plus Youth, Women, and Children, and Ms Salama Aboud Talib, who takes over as Minister for Land, Water, Energy, and Environment. There are five Deputy Ministers who are all new faces. 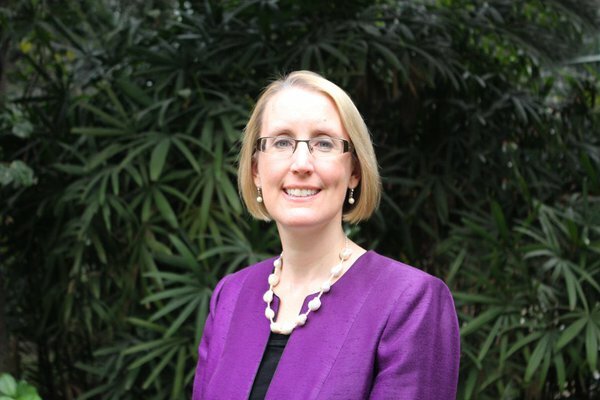 Sarah Cooke, pictured, has been appointed British High Commissioner to the United Republic of Tanzania in succession to Dianna Melrose, who will be leaving the Diplomatic Service. Sarah will take up her appointment in July 2016. This was announced by the Foreign and Commonwealth Office in early February, and was followed by rumours that the current High Commissioner had been recalled at the request of the Tanzanian government. The FCO later issued a second statement, denying that this was the case. “Contrary to some media reports, the British High Commissioner, Dianna Melrose, will not be ending her mission in Tanzania until the end of July 2016, at the normal conclusion of her posting,” read the statement. Sarah Cooke has worked for the Department for International Development for the past 11 years, since 2012 as Country Representative for DfID in Bangladesh. This will be her first posting in the Diplomatic Service. Relations between the diplomatic community and the Tanzanian government have been tense since the disputed Zanzibar elections, and perceived interference of diplomats in domestic matters. See Foreign Relations section for further details. Following the second Zanzibar elections, relations between Tanzania and the western powers (the USA and EU) have cooled. Among the many changes being proposed and/or implemented under the new Magufuli regime, the government has announced restrictions on the movement of diplomatic personnel and consular staff as well as the staff of international aid, other aid agencies and other organisations. In future, they will have to obtain government clearance for all their planned activities, including any meetings with leaders of various political parties. They will also have to seek permission from the Ministry of Foreign affairs before travelling upcountry and meeting local government authorities. The government said that this is normal diplomatic practice. in issuing a statement asking President Magufuli to intervene in solving the electoral controversy in Zanzibar. The post election stalemate in Burundi continues to cause concern in Tanzania because of the number of refugees crossing over the border from Burundi. Some 85,000 are understood to have been registered. Some of the old refugee camps in Tanzania are being used again but there is overcrowding and a lack of hygiene as there is an acute water shortage in the border area. The refugees are said to have no fire wood and their make-shift shelters cannot withstand rain storms. A statement by the UN Office in Tanzania has said that $11 million have been allocated to respond to urgent needs. At almost the same time as The East African was being allowed to be sold again in Tanzania, another ban was imposed on the Swahili weekly newspaper Mawio, which was accused of publishing seditious material. The new Information Minister Nape Nnauye said that the paper had published alarming and inciting content over the elections. Tanzania’s new president has been receiving plaudits from around the world for what he has achieved in attacking corruption and reducing unnecessary government expenditure in a very short period of time. The founding Father of the Country, Mwalimu Julius Nyerere, who ruled Tanzania in the days when Apartheid still existed in South Africa, always tended to put foreign policy at the top of his list of priorities as he used his influence to bring about the fall of the Portuguese Empire in Mozambique and Angola, and brought China into Africa to help build the Tazara railway. Succeeding Presidents followed his example by making sure that Tanzania’s voice was heard around the world. In the first days of President Magufuli’s rule, however, he has indicated that he has other immediate priorities. Since his inauguration, there have been four global summits and a mini- SADC summit, none of which he attended. There have also been the Commonwealth Heads of State and Government Summit (CHOGM) held in Malta in November 2015; the Paris Climate Change Summit in December 2015; the Africa-China Summit in South Africa in December 2015; and the African Union Summit in January 2016. The first two were attended by the Tanzanian ambassadors in London and Paris respectively. The other two were attended by the new Tanzanian Vice-President, Samia Suluhu Hassan. A mini summit of the SADC organ on peace and security in Botswana in December, was attended by Prime Minister Kassim Majaliwa. By the President not attending the CHOGM summit in Malta and cutting the size of Tanzania’s delegation from 55 to only 4, the government saved an estimated TSh 750 million. As regards the African Union (AU) two summits are held each year compared with its predecessor (the OAU) which held only one. A Tanzanian proposal to reduce it to once every two years was rejected by other members. President Magufuli did not attend his regular annual meeting with members of the diplomatic corps at State House in Dar es Salaam in February 2016, although he was represented by his Minister for Foreign Affairs. 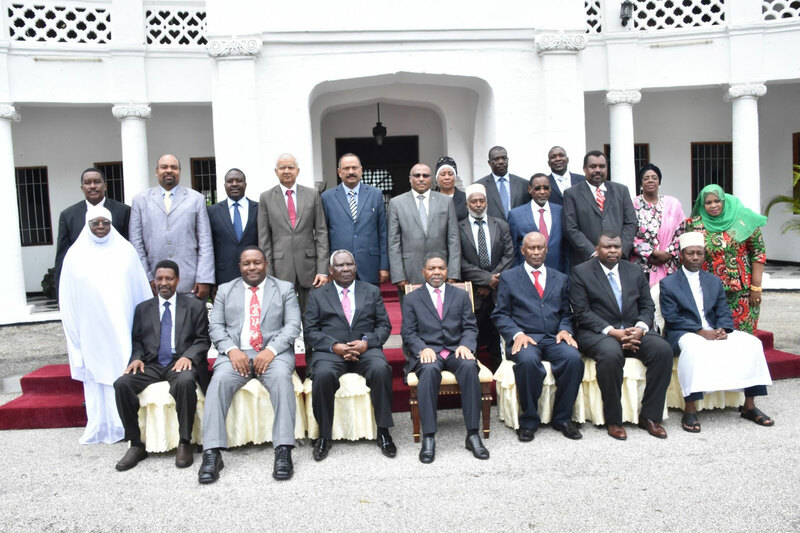 As far as Zanzibar is concerned, the President has presided over several meetings to try and resolve the situation but the participants were unable to reach a compromise solution. The results of the second Zanzibar election have caused much dismay in America and Europe and the Millennium Challenge Corporation (MCC), which controls most of America’s $472,000 aid programme (this year), immediately stopped aid. This had to be done because, under US law, these funds can only be provided to countries with clearly democratically elected governments. Finance Minister Philip Mpango reacted by saying that the government had anticipated the move by the MCC and had worked out alternatives. Dr. Mpango stated that Tanzania was looking for other funding for the projects and added that when President Magufuli took office he had laid emphasis on revenue collection with the aim of reducing dependency on foreign aid. He said that he hoped to engage in discussions with the MCC in order to know why it had made its decision and what Tanzania should do in order to be reconsidered. The MCC also sought assurances from Tanzania that the new Cyber Crimes Act would not be used to limit freedom of expression and association. The US claimed that Tanzania had moved forward with a new election in Zanzibar that was neither inclusive nor representative, despite the repeated concerns expressed by the US government and the international community. Tanzania had also not taken measures to ensure that freedom of expression and association were respected in the implementation of the Cyber Crimes Act. It is reported that an estimated 5,000 teachers said to be illegal immigrants, most of whom came from the East African region, are to be expelled from the country. This has caused concern amongst educators. Private schools are largely dependent on foreign teachers, particularly for English and Science, and these expulsions are expected to have a major negative impact on private English Medium schools. Late in 2015, a landmark judgement in the UK courts saw Standard Bank fined US$25m and ordered to pay the Tanzanian government US$7m in compensation. The “deferred prosecution agreement” (DPA) suspended a case against Standard Bank for its alleged failure to prevent bribery. It relates to a $6m payment made in 2013 by Stanbic Bank Tanzania, then a sister company of Standard Bank, to a local agent, Enterprise Growth Market Advisors (EGMA), associated with Tanzania’s US$600m private bond placement. The judge in the case, Lord Justice Leveson, concluded that Standard Bank “did not have adequate measures in place” to guard against corruption, and did not conduct sufficient due diligence in relation to EGMA. EGMA was paid $6m for assistance in arranging the bond issue, though there was no evidence that the firm actually provided any services. One of EGMA’s directors was Harry Kitilya, then Commissioner General of the Tanzania Revenue Authority, a potential conflict of interest. The payment to EGMA was financed by raising the cost of the service provided by Standard Bank to the Tanzanian Government from 1.4% to 2.4% ($8.4m to $14.4m) of the total bond issue. This is the first use of a DPA in UK courts. It allows for criminal proceedings against a company to be suspended provided that the company meets certain conditions. A prosecution may follow if the conditions are not met within three years, otherwise the Serious Fraud Office (SFO) will discontinue proceedings. The case was initiated by Standard Bank itself reporting concerns to the UK authorities, when close to $6m in cash was withdrawn from EGMA’s account over nine days in March 2013. Observers are speculating whether the firm really decided of its own accord to self-report in this way, or whether they did so under pressure. Tanzanian opposition MP, Zitto Kabwe, argued that Standard Bank could have falsified information given to the SFO in order to reduce the fine. The case raises difficult questions for the Magufuli administration, which has in other cases acted swiftly and decisively against corruption. The DPA does not prevent Tanzanian authorities from investigating further or from bringing a case against Standard Bank, Stanbic, EGMA or government officials involved in the bond issue. In January, Valentino Mlowola, Director General of the Prevention and Combatting of Corruption Bureau (PCCB), said investigations into the Standard Bank case were at “final stages,” and promised that “soon you will see grand corruption suspects taken to court.” This has not yet happened. Meanwhile, Tanzania has a debt of $600m, which may not have been negotiated on favourable terms. Standard Bank and Stanbic Bank were appointed to manage the bond placement following a closed bidding process, and the placement attracted a 6% interest rate – substantially higher than the 4% achieved by Zambia and Ghana. Corruption Watch UK estimate that the potential cost to Tanzania could be as much as $80m over the life of the bond. On Workers Day, May 1, just as Tanzanian Affairs was going to press, President Magufuli announced a reduction in the basic rate of income tax. The rate for monthly salaries between TSh 170,000 and 360,000 has been cut from 11% to 9%. The higher rates for incomes above TSh 360,000 are unchanged. As a result, a worker on a monthly salary of TSh 360,000 or above will be better off by TSh 3,800 each month, or TSh 45,600 over the course of a year. Announcing the change, President Magufuli stated that the move aims at alleviating the burden of tax on workers. “I promised during my campaign to reduce pay as you earn tax to single digits. Now I declare to reduce it from 11% to 9%. I know this percentage will create a gap in our revenue, but we shall see how to fill it,” said President Magufuli. Professor Haji Semboja of the University of Dar es Salaam said that the amount returned to workers as tax reduction and its impact on economy was minimal. “The government has increased workers’ purchasing power by 2% … it’s something … but not that much.” Professor Honest Ngowi of Mzumbe University, said the 2% tax-cut on s alaries at the end of day was likely to be chopped off by inflation, exchange rate and consumable tax increase in the 2016/17 budget. Tanzanian President Magufuli and Ugandan President Museveni have agreed to build an oil pipeline between south western Uganda and Tanga port, allowing the oil discovered in Uganda in recent years to be commercialised and exported via the Indian Ocean. The deal was reached between the two leaders in March at the 17th Ordinary East African Community summit in Arusha. The pipeline will be up to 1,400 km in length and will take an estimated 3 years to build, employing some 15,000 Tanzanians and Ugandans in the construction work. Construction could commence as early as August this year. The total cost is put at US$ 4 billion. In a separate statement, the Managing Director of the Tanzania Petroleum Development Corporation (TPDC), Dr James Mataragio, announced that the pipe will be 24 inches in diameter and will be able to transport 200,000 barrels of crude oil each day to the port at Tanga. The project will also stimulate the expansion of the port there. Other important details still under discussion include what revenues the Tanzanian Government will earn from the project. The decision to build this Ugandan oil export pipeline through Tanzania – the so-called ‘southern route’ – hopefully ends a year of uncertainty and speculation. Last year the Ugandan Government initialled a Memorandum with the Kenyan Government, providing for the possibility of the pipeline following a ‘northern route’ through Kenya to Lamu. Mataragio said the southern route has now been chosen partly because of Tanzania’s proven experience of constructing and operating long-distance petroleum pipelines. Concerns over recent terrorist attacks in Kenya are also believed to have influenced the choice. Unlike in Tanzania, oil discoveries have been made in both Uganda and Kenya over the last few years. In March, Tullow Oil announced it had made a new oil discovery in Kenya, potentially opening up a second oil basin in that country. However, the continuing low price of oil on world markets is inevitably slowing the pace of petroleum exploration around the globe by the international oil companies, which now have significantly reduced revenues from which to fund it. Meanwhile, TPDC announced that the new Songo Songo Island Gas Processing Plant would be commissioned during April, only a couple of months behind the original schedule. Some of the first gas to be processed at the new plant will come from the Kiliwani North-1 (KN-1) production well, operated by Aminex plc and Solo Oil plc. The CEO of Aminex (an independent oil company that has held licences in Tanzania since 2002) announced that testing and other work necessary prior to production of gas from the well had been completed. In a statement, Aminex said: “All KN-1 gas will be sold to the TPDC at the wellhead for an agreed price of approximately US$3.07 per million standard cubic feet and will ultimately be transported by pipeline to Dar es Salaam, where it will be sold into the local Tanzanian market”. In March the Minister for Energy and Minerals, Professor Sospeter Muhongo, joined TPDC and representatives of the UAE-based company Dodsal Resources to confirm the discovery of natural gas reserves estimated at 2.17 trillion cubic feet (tcf) in a license block operated by Dodsal in the Ruvu Basin in Coast Region. Gas was encountered through the drilling of the Mambakofi-1 well there last year, since when tests and analysis have been undertaken which have upgraded significantly the initial estimates of gas in the field. The Minister explained that the announcement had been delayed in order to meet the new provisions of the Petroleum Act 2015. Dodsal has been operating the Ruvu block under the terms of a Production Sharing Agreement signed with TPDC and the Government in 2007. The company now needs to prepare an appraisal and development programme for Government’s approval. Dodsal’s CEO said that “Exploration is still ongoing and we are optimistic of striking more natural gas reserves in the Ruvu Block”. The discovery is especially exciting because of its very close proximity to Dar es Salaam, which will provide a ready domestic market for the gas. The Ruvu discovery brings Tanzania’s gas reserves offshore and onshore to 57 tcf. It is expected that the development of these very substantial gas reserves will help Tanzania to graduate to middle-income country status by 2025, as stipulated in the Tanzania Development Vision 2025. Minister Muhongo emphasised that “This will be possible when we have adequate and reliable electricity in the economy”. The Government has had to step in to hold discussions with Tanzania’s independent power producer, Songas, to try to prevent it from shutting down because of the large accumulated unpaid debt it is owed by the State electricity utility, TANESCO. The Managing Director of Songas announced that TANESCO owed his company about US$100 million in back payments. He said there is always a risk that Songas would have to close if those arears are not paid; Songas needs the monies to fund further investment in its power supply infrastructure. TANESCO is the sole client of Songas, so the accumulating arears are a major issue for the firm. It is understood that Songas produces about 25% (180 megawatts) of the national grid’s electricity requirement from the Songo Songo gas field – so any disruption in Songas’ power supply would be serious for Tanzania too. Two tiers or not two tiers? Will it all end in tears? It was in 2011 when President Kikwete initiated the process of reviewing the current constitution with a view to ensuring that Tanzania would be equipped with a new constitution which would be fit for modern day Tanzania. That was of course five years ago. “Why is this taking so long?”, you may ask. I feel you will not get a straight answer to that question through official channels. If you do manage to get any kind of response, depending on whom you ask, it is likely that either the government or the opposition will be blamed. The former will be blamed for hijacking the process, ignoring the so called “people’s draft constitution” produced by the Constitutional Review Commission (CRC) led by retired Judge Warioba. The opposition, and in particular, UKAWA, are accused of trying to frustrate the whole process for political gain. This is not an argument over proposals in the draft over education, health, gender equality, children’s rights etc. Sadly, those issues have been paid little attention by those responsible for debating and approving the final draft. The big bone of contention in the proposed constitution has always been the structure of the Union: whether there should be a two-tier government as there currently is, or a new three-tier government which, amongst other things, gives more autonomy to Zanzibar. Warioba’s CRC included a three-tier government because their consultations indicated that the majority of both mainland Tanzanians and Zanzibaris were in favour of it. On the other hand, CCM were always against a three-tier government and managed to controversially push a final draft through the Constituent Assembly which kept the current structure. This led to the formation of the opposition UKAWA coalition. The Civic United Front (CUF) boycotted the re-run elections in Zanzibar in March and has made it clear that it does not recognise the new Zanzibari government; they are likely to fight CCM on most issues. The political unrest in Zanzibar has always been a source of frustration for the government. The constitution review process has not helped in bringing calm. If anything, it has reopened old, deep wounds – the type which leave permanent scars. In simple terms, the balance of power distributed between the mainland and Zanzibar is seen as very unsatisfactory by many Zanzibaris. In the eyes of politicians, this has become much more than ensuring that basic and fundamental rights are enshrined in a new legal document. This is a power struggle. A national referendum on the constitution was due in April last year, but was postponed indefinitely. There had been suggestions that the referendum would take place at the same time as the elections last October, but this did not happen.There has been a deafening silence from the current government regarding a new constitution. CHADEMA’s new Secretary-General, Dr Vincent Mashinji, in his first speech as leader, has already called for a fight for the new constitution. Whilst he was of course referring to a metaphorical fight, it is possible that actual fighting over this issue could be in store over the coming months. “From now on, all MPs will have to embrace an agenda for the new constitution while in the House. The rest of us will do so outside the House by exercising all our civic and constitutional rights and, if need be, staging demonstrations in demand for the same,” he passionately demanded. The nation awaits a response from President Magufuli or CCM. President Magufuli has officially opened Julius Nyerere bridge in Dar es Salaam. 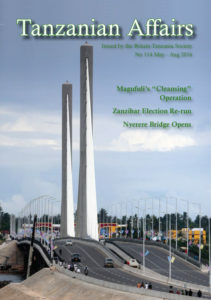 The bridge, previously known as Kigamboni bridge, provides a second link between Kigamboni and Dar es Salaam city centre, relieving pressure on the Kivukoni ferry crossing. The bridge is 680 metres in length, making it the longest cable-stayed bridge in East Africa. It is six lanes wide, plus pedestrian / cycle lanes on each side – a total of 32 metres. 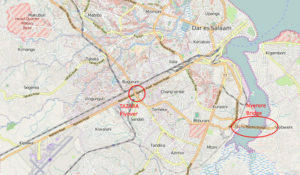 The road connects to the Mandela expressway, close to the national stadium, and to the Kigamboni-Kibada Road on the Kigamboni side. It took nearly five years to construct, at a cost of US$143m. The work was carried out by the China Railway Construction Engineering Group in a joint venture with the China Railway Major Bridge Engineering Group and Arab Consultant from Egypt. Officially opening the bridge, President Magufuli commended the contractors and local bodies that had been involved, including Tanzania Roads Agency, the Ministry of Works and the National Social Security Fund, which put up 60% of the cost. In his previous role as Minister of Works, President Magufuli had played a key role from early stages of the bridge’s construction. At the launch event, President Magufuli suspended the Dar es Salaam City Director, Wilson Kabwe, after the Regional Commissioner, Paul Makonda, told the gathering that the director had cost the city council TSh 3bn by using outdated by-laws governing Ubungo bus station. The President asked the gathered crowd what action he should take, and was encouraged to “tumbua jipu” (lance the boil). The bridge will be operated as a toll bridge, enabling NSSF to recover its contribution to the construction costs. The price will be the same as the Kigamboni Ferry crossing. “It’s a dream come true, I never expected this to happen in my life time,” said Mzee Iddi Amri Saadi, a 72 year old resident of Kigamboni who for over five decades has been crossing the entrance of Dar es Salaam port on wooden boats or ferries. “It was about 27km drive this morning from home to office, (which took about 1 hour thanks to Nyerere Bridge). It used to take about 3 hours (to reach the office) via ferry by car,” said Irenei Kiria, a resident of Kigamboni. 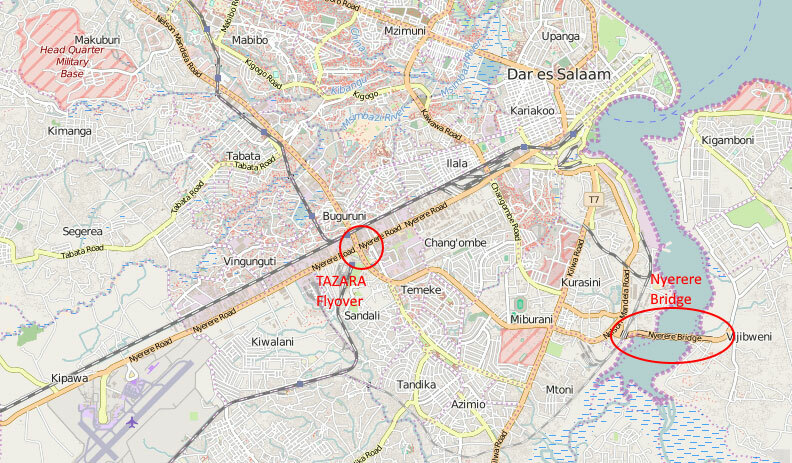 A ground-breaking ceremony for the long-awaited TAZARA flyover project in Dar es Salaam was held in April. The junction, where Nelson Mandela Road and Julius K Nyerere Road meet, halfway between the airport and the city centre, has long been the focus on discussions on reducing traffic congestion in the city. Speaking at the ceremony, Patrick Mfugale, Chief Executive Officer for the Tanzania National Roads Agency, said the project would cost $50m, of which the government of Japan was contributing $46.5m. Makame Mbarawa, the Minister for Works, Transport and Communications, said that on completion, traffic congestion in the city will be reduced by 80%. President Magufuli used the opportunity to speak about other planned transport projects. This included a six-lane 128km highway from Nyerere Bridge (Kigamboni) to Chalinze, with five flyovers, plans to upgrade the central railway line to standard gauge and to construct a 7km road bridge from Coco Beach to the city centre. Scientists from various research institutions, including the University of Nairobi, the International Potato Centre (CIP) in partnership with the University of Missouri and regional civil aviation authorities in Tanzania are working on a pilot project where a drone was able to pinpoint 14 different varieties of sweet potatoes at the Ukiriguru Agricultural research Institute near Mwanza. This drone-based remote sensing technology is being described as a ‘game changer’ in the gathering of agricultural statistical data. It is relatively cheaper than other methods, boasts high quality sensors, and allows collection of accurate data on a large scale with minimal effects from clouds or rain, which, in some areas, blur images taken by satellites. The drone is able to map everything on the ground, after which the data is processed by specialised software to enable scientists to zero in on their area of interest. The drones can gather data on all food crops in a particular area and point out diseases and water-stressed areas thus making them an important tool in irrigation scheduling. The drones have been known to detect diseases in a field two weeks before the symptoms become obvious to the human eye. Sweet potatoes are being used as the pilot crop. Drone technology can also help identify the right pesticides to use on plants. The images captured by the drone can also map areas on a farm where there are diseases or a lack of soil nutrients. The locally assembled drones, known as ‘Octocopters’, have eight multi-rotors and a maximum range of 200 metres from the ground. They can carry up to 2.5kg including the weight of the drone and a 1kg regular camera equipped with specialised sensors. The equipment is powered by rechargeable batteries that can each last 10 minutes per session. According to a report in the East African on 20 February 2016, Tanzania is planning to identify underdeveloped parcels of land with the aim of repossessing them. Minster for Lands William Lukuvi has announced that ownership of idle land would be revoked and the land re-allocated as part of wider efforts to end long-standing land disputes in many parts of the country and to ensure equitable distribution of land. A special audit would be part of a $15 million land tenure support programme. “Our intention is to identify those holding large areas and farms without developing them. We will revoke their title deeds and give the land to those in need. Any investor who needs land should come to my office with a business plan and I will give them land in any region even Dar es Salaam” said the Minister. Villagers in Hanang district, Manyara Region, whose land has been taken over in recent years under various schemes of the defunct National Agricultural and Food Corporation (NAFCO) have been complaining for years at the loss of their land. This first happened in 1969 for a large capital-intensive Canadian-supported wheat project. In the 1980s some 100,000 acres were under wheat cultivation and the wheat produced met at least one third of the nation’s total demand. However, the scheme collapsed in 2003 after Canada had invested $44 million. (see TA 51 and TA 29 for some background). The government then invited private investors to develop the land but this has not pleased the local people who are now pleading with President Magufuli to help them to get back their land. The tomato leaf miner, scientifically known as tuta absoluta, which has been prevalent in the Arusha region of Tanzania since 2014, before spreading to other parts of the Tanzanian mainland, has now arrived in Zanzibar. One mainland farm manager was quoted as saying that they had lost nearly a thousand tonnes of tomatoes worth 350,000 dollars. Zanzibar has called in experts from mainland Tanzania to help it to bring the insect under control. After inspecting parts of the Kalamazoo Forest in Rukwa Region during a surprise visit, Minister of Natural Resources and Tourism, Prof. Jumanne Maghembe, suspended five senior forestry officials for mismanagement. He stated that this action was preliminary to the launching of an investigation into allegedly gross mismanagement which had allowed illegal harvesting of logs worth TSh 500 billion. The Minister issued a 10-day ultimatum to the Tanzanian Forest Service to move logs to a nearby police station where they would be auctioned with the revenue being deposited in government coffers. 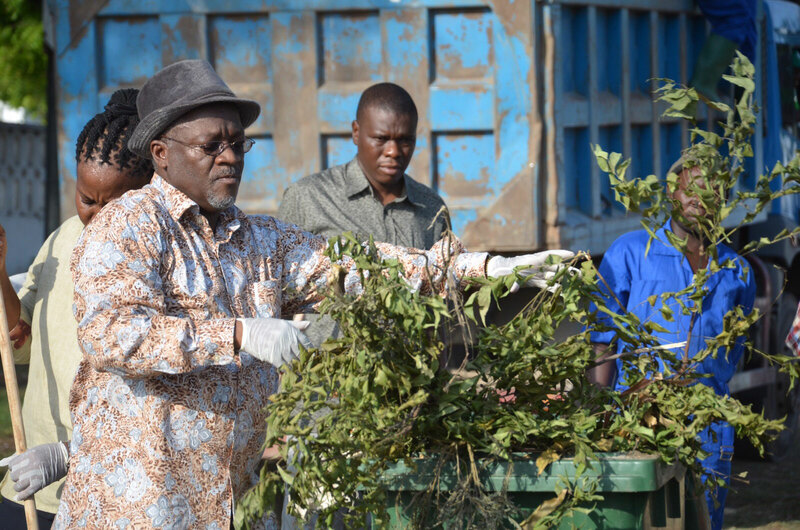 The local District Commissioner also revealed that unscrupulous log traders were colluding with some dishonest leaders and forestry officials to harvest the prohibited ‘mkurungu’ tree logs at night and export them to Zambia. In a volcanic crater lake in Tanzania, two species have emerged from one fish according to an article in the London Financial Times (Thank you Jill Bowden for sending this – Editor). The writer of the article Clive Cookson said that evolutionary theory suggested that there must be some geographical or physical barrier. Otherwise, constant genetic mixing would keep the population as one species. Observation of small fish called cichlids, evolving rapidly in East African lakes, show that barrier-free divergence, known technically as ‘sympatric speciation’, does sometimes take place. Lake Malawi, for example, contains more than 500 different cichlid species that must have evolved from just a few originators – an evolutionary burst that has led biologist to call the lake ‘Darwin’s Pond’. The diversity and complexity make it hard for scientists to disentangle the genetic processes involved. UK researchers from the Wellcome Trust Sanger Institute and Bristol, Bangor and Cambridge Universities, are investigating the much smaller Lake Massoko, a volcanic crater lake in Tanzania, where two species are emerging from a single cichlid. The evidence from Lake Massoko, which they dub ‘Darwin’s Puddle’, appears in the journal Science.